Starting with version 4.50 of Sage ERP MAS 90 and 200 Sage have added a new “phone home” feature which they advise is purely optional and can be enabled or disabled by the user. Sage provides a full explanation of their PEP program here. We collect information about your usage of the software program, the hardware used to run the program, and statistics about your company. We also collect the serial number of your product so that we can identify trends over time for a given installation. We do not collect financial information from your company information. For example, we may be interested in how many Sage ERP MAS 90 and 200 customers use “Enter Cash Receipts” versus “Apply Payments and Memos”, but we will not collect any information contained in the individual transactions. What version of Sage ERP MAS 90 and 200 is installed? What auditing features are enabled? How often is the “Shipping Data Entry” screen used? How many transactions are in the system? What is the serial number of the product being used? What is the operating system running Sage ERP MAS 90 and 200? Does the company use finance charges? We are interested in aggregating usage data so that we can identify areas of the program that we need to improve. We may also use the information we gather to create offers that suit your individual needs. As we continue to gather and analyze data, we may change the types of data we collect to better achieve the goal of improving our products and services. Those changes will be transparent and will not affect your work. How often will I be sharing this anonymous information with you? We anticipate that the information will be shared once per day. How is data sent and stored? All information will be sent automatically via the Internet. Once you join the Product Enhancement Program you don’t need to do anything else. Data transmission takes place in the background, without disturbing your current tasks, and should not affect the performance of your computer. Data is encrypted during transmission using SSL and is stored securely. We follow generally accepted industry standards to protect the information submitted to us, both during transmission and once we receive it. Will you be sharing this information with other companies? Sage will use this information for internal purposes only. How long will the Product Enhancement Program run? The program will run indefinitely or until you choose to discontinue participating. To opt out of the program, please click Product Enhancement Program from the Administrative Tools menu. Once the study has been turned off, no more data will be collected or sent. You can join or drop out of the program as many times as desired. 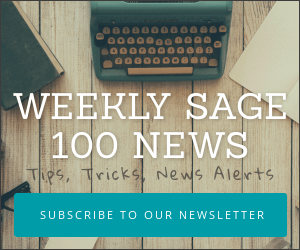 First, login as Administrator (if you don’t have your password for this — contact your Sage Business Partner or Sage Software 800-854-3415). 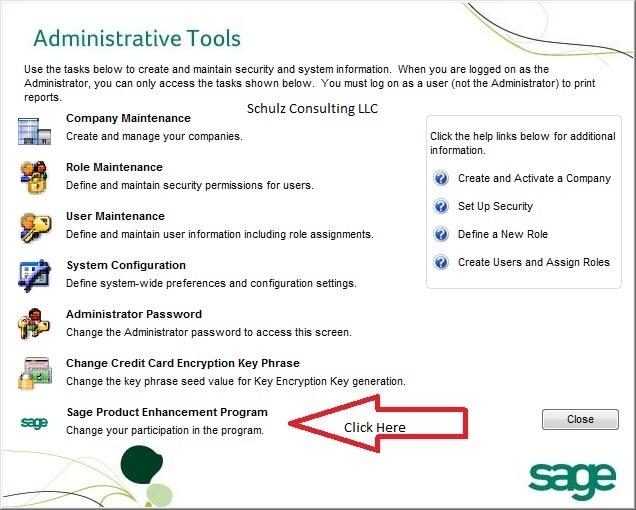 Second, from the administrator screen select the last option “Sage Product Enhancement Program – Change your Participation In The Program”. Finally, remove the check mark next to the participation. Note: At this time it appears that you must opt-out each time a product update is installed as some users have reported that when they install the product update they find that they have re-enrolled after specifically opting-out.. Tested installing Sage ERP MAS 90 v4.50 PU2 after opting out on PU1 and the Opt-Out for PEP remained (as it should have) after the PU update.